Everything is bigger in Texas, including the summer heat! Located about 30 miles southwest of Fort Worth is the town of Granbury, Texas – our warmest spot in the U.S. this June. It was the 2nd warmest June on record in Granbury at just over eight degrees above average. Every day in June featured above average temperatures, 14 of which were at least ten degrees above average. There were 17 days where the mercury climbed over the 100-degree mark; that’s the second most for any June in Granbury. If that wasn’t bad enough, there were 26 straight days of 90-degree heat making for both the longest June heatwave and the 10th longest of any month on record. 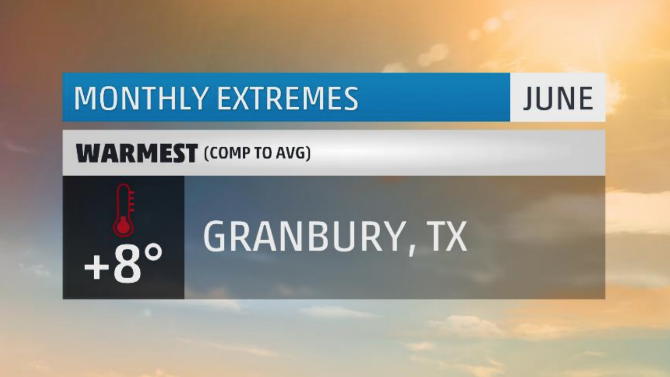 With a sweltering 105 degrees, Granbury set their 2nd warmest June temperature and 6th warmest all-time temperature. The air conditioners were getting an overnight workout as well. Granbury set their warmest June overnight low temperature at 82 degrees. That was also warm enough to be their 5th all-time warmest low. Aided by what seemed to be day after day of sunny weather with southerly winds, Granbury managed only a trace of rain and had an average daily dew point temperature of 68 balmy degrees. The heat index, which is how warm it feels on your skin and is calculated by factoring the air temperature and the dew point, was in the triple digits almost every day in Granbury during the month of June. Amidst the heat, 14 daily high temperature records and another 10 daily warm overnight low temperatures were broken. Yuck. It was another month of runaway warmth. Some 270 cities had one of their top ten warmest Junes on record in 2018. Another 441 cities would tie or break at least one daily high temperature record. Twenty-three of those would set their all-time warmest June temperature. 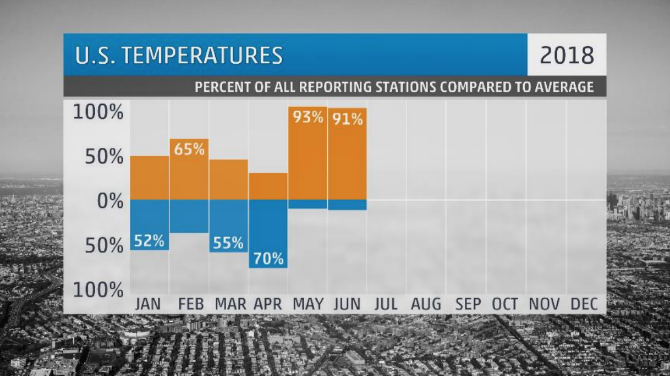 For the second month in a row, over 90% of weather reporting stations across the U.S. ended the month with above average temperatures. Odds are, where ever you call home in this country, you were under the thumb of oppressively hot weather at some point in June. 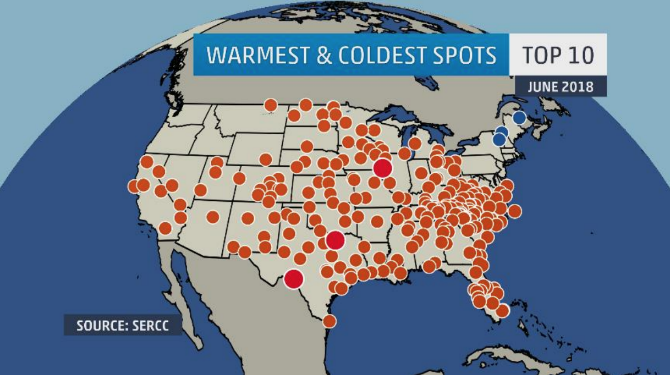 The last spot on I-95 before you hit Canada was also the coldest spot in the U.S. this past June. That spot would be Houlton, Maine. 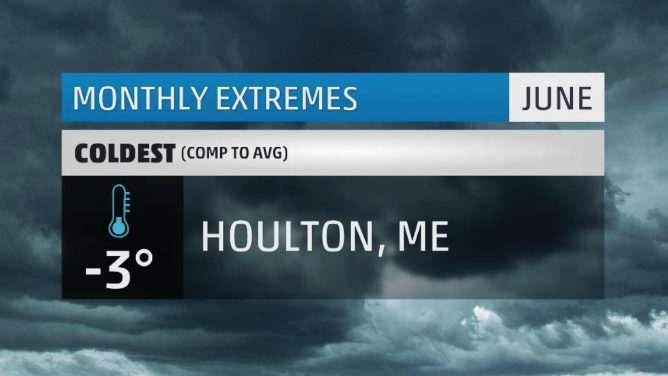 Mainers living in Houlton experienced their 8th coldest June on record. Nineteen days featured below average temperatures with three being at least ten degrees below average. In a month where daily high temperatures range from 69 to 76 degrees, 11 days ended up cooler than 69 degrees. There was even one day where the temperature failed to reach 50! That day would end up being the 9th coldest June day on record. It was just as cold overnight. In a month where average daily lows range from 43 to 52 degrees, 16 lows ended up cooler than 43 degrees. That’s a record for the month of June. Eleven of those nights were colder than 40 degrees and one night managed to dip all the way down to 30! That 30-degree low was the 5th coldest June low on record. Houlton had two cold high temperature records and one record low temperature this month. One of the main culprits for all the cold weather in Houlton was days and days of rain. Thirteen days had measurable rainfall and 19 days were partly sunny or worse. By the way, there were only two spots in the northeast where the temperature dipped below freezing during this past June. One, as we just discussed, was Houlton. The other: the top of Mt. Washington at 6,200 ft. Not bad. Our spot for wettest location is proof that it only takes a few bad thunderstorms to make for a waterlogged month. At just over 14 inches, Rockford, Illinois set both its wettest June on record and its wettest month of any month on record. It did so on just 12 days of measurable rainfall. Six days had at least an inch of rain, and of those, three had over two inches. The worst of the rain came from three training thunderstorm events that produced flash flooding in the area. One storm in particular dropped over a half inch of rain in just ten minutes. That’s a rainfall rate of over three inches per hour! Water flowed into hospitals, shopping centers and homes. There were also a number of high water rescues for people trapped in their vehicles. Rockford would set four daily rainfall records. All this just after they had their 5th wettest May on record. Talk about some wet times for northern Illinois. 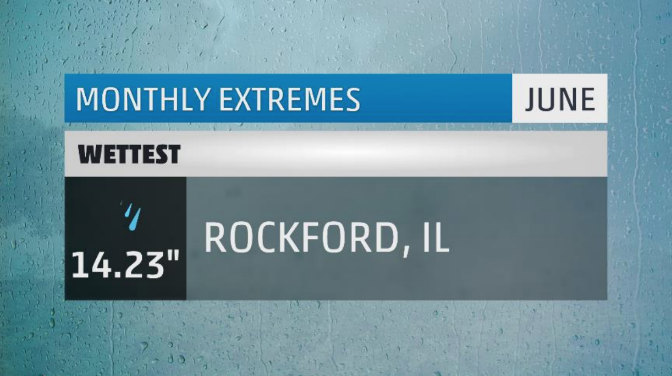 It was a tight competition for wettest spot in the U.S. this June with four cities coming within an inch of Rockford’s monthly total. Richmond, Beaumont, Kississimee, and Gatlinburg all received over 13 inches of rain in June. 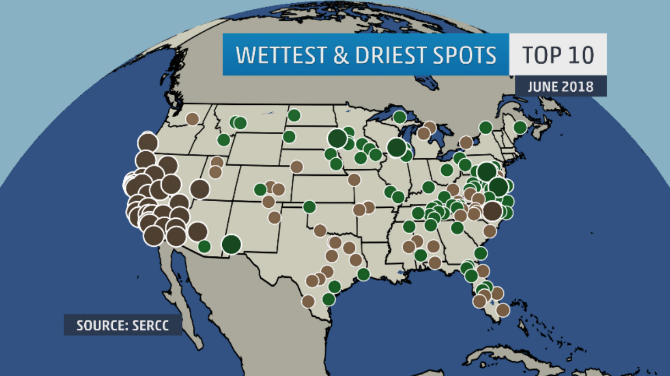 Over 90 cities would set on of their top ten wettest Junes on record in 2018. Rockford and Richmond set their wettest June on record. Both cities dealt with multi-event thunderstorms that dropped torrential amounts of rain over an extended period of time. Three hundred and sixty five cities would break or tie at least one daily rainfall record in June. Another 34 would break or tie their wettest June day ever on record. This includes Richmond, VA., which would see over seven and a half inches of rain in one day. That’s enough to be their second wettest day on record. 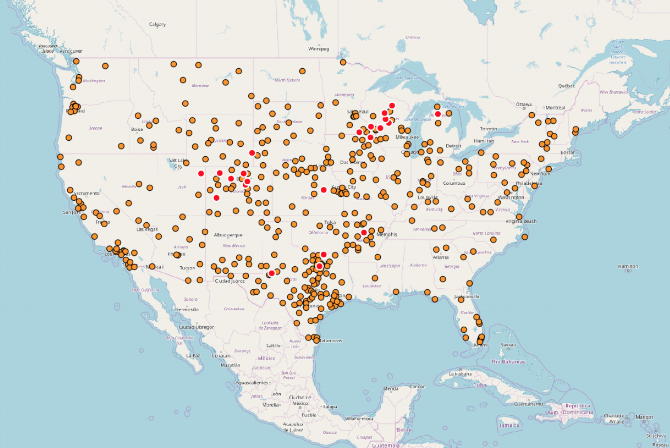 Okay, technically out of the 800 or so main weather reporting stations we use to create this article every month, none of them recorded a flake of snow in June. But hey, this is my article and I’ll break the rules if I want to! But keep in mind, this particular city is not a major reporting station. 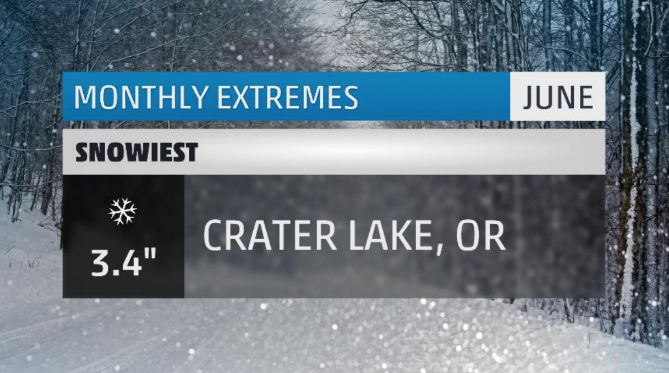 Crater Lake, Oregon, at over 6,500 feet in elevation, was one of just six smaller reporting stations to pick up measurable snow in the month of June (and we’re talking about a total network of over 10,000 weather reporting stations). Their 3.4 inches would make for the 35th snowiest June on record. Believe it or not, but their snowiest June produced a whopping 25 inches back in 1950. Good for them. Our next stop takes us to California wine country where hot days, cold nights, and lots of sun are the perfect recipe for grape growing and wine making. 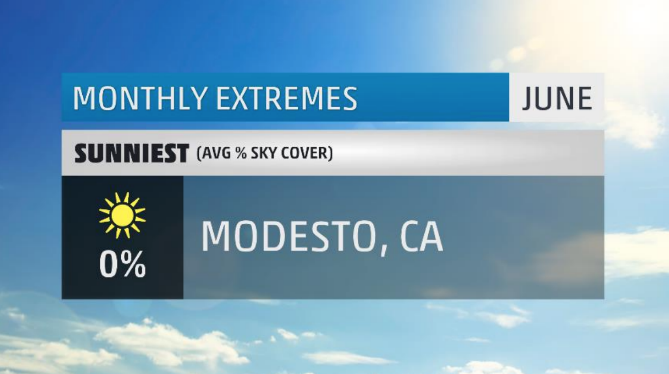 Modesto, CA was our sunniest spot in the country this past June. Every day of the month was cloud-free, and no surprise, they also picked up zero inches of rain. One interesting note: their average diurnal (the difference between the day’s high and low temperature) was 32.5 degrees! They, on average, had highs in the 90s and lows in the upper-50s to low-60s. Talk about a daily temperature whiplash. Modesto’s sunniest time of the year is right now and last through October. 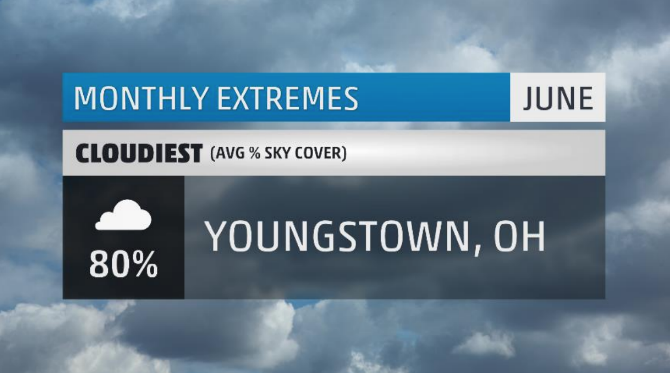 We’ll end with a repeat offender this year in the category of cloudiest city in the U.S. Youngstown, Ohio was previously our top cloudy spot back in April. This June, they’ve once again topped the list. Twenty- six of June’s 30 days were mostly cloudy or worse and were accompanied by 17 days of measurable rainfall. They would pick up just over 6 inches of rain for the month making for the 7th wettest June on record. They also had 21 days with foggy conditions, making things seem and feel all that more gloomy. Even with all the cloud cover, fog, and rain, they still managed to end the month two degrees above average. You win some, you lose some. There you have it, the extremes for the month that was June 2018. Make sure to check back next month to see what July has in store! What weather extremes did you face in June where you live? Let me know in the comments below. Check out the Monthly Extreme Weather page for more.